Dorothy Dean (Shewcraft) Young was surprised with an 80th birthday party on Nov. 28. The party was held at the Christian Church Community Center in Owensboro, KY. Party was given by her daughters Kathy Ellis and Ann Yaudes. Friends and family attended with entertainment by Betty Shewcraft Hodges, Matthew and Mandy Hodges. She was also honored by the United Daughters of the Confederacy. Dot, as she is called by her family and friends, is known for her humor and good deeds for others. Stories were told by family and friends of their most cherished memories with her. She grew up in the Frances and Mexico community. Her parents were Luther Frances and Oda Lee (Patton) Shewcraft. Her siblings Edna Macon, Betty Hodges, Carolyn DeSpain, Carlton Shewcraft, Minnie Nell Martin (deceased) and Keith Shewcraft (deceased). We received the following Crittenden County genealogy query: "As a sixth descendant granddaughter of Joseph Newcom and Esther Dudley, I am trying to locate any data before Joseph Newcom immigrated to the U.S. Parents, siblings, POB, residence, etc. I would also like to obtain photos of this family pre and post immigration and family information. Contact Denise Newcomb at deedeenew@yahoo.com." An interesting tidbit to report for genealogists: The Glenn Martin Genealogy Library in Princeton has received a wonderful Christmas gift in the form of a donation of the research files of the late Willis "Pat" Oliver, a native of Lyon County. The files were donated by Pat's widow, Trevah, and will be available for use by other researchers after they have been sorted and catalogued. Pat, a long time genealogist, was the original county coordinator of the Livingston, Caldwell, Crittenden, Lyon and Trigg County KYGenWeb sites. Among the families he researched were Oliver, Galusha, Parent, Throop, Chittenden and McCracken. (Source: Western Kentucky Genealogy Blog at wkygenealogy.blogspot.com). December birthdays to report include Helen Travis (12/3), Angie Beverly Way (12/5), Chanda Guess Ortt (12/6), Clara Brown (12/8), Bobby Waters (12/9), J.R. Blake (12/11), Lonnie Travis (12/13), Matt Maxfield (12/13), C.T. Conner (12/14), Emily Smith (12/16), DeLois Paddock (12/17), Heather Guess Franklin (12/17), Travis Boone (12/19), Raymond Guess (12/24), Ryan Downing (12/27), Wade Brasher (12/30) and Jonathan Millikan (12/31). If you haven't already, become a fan of dycusburg.com on Facebook. News, photos and historical items are posted regularly at the site. To share information for this column, please use this new e-mail address: news@dycusburg.com. Best wishes to everyone for a Happy New Year. Ruth Hard Rodgers, 94, of Princeton, died Nov. 29, 2009 at Rivers Bend Retirement Community. She was a homemaker and was the oldest member of First Baptist Church of Fredonia where she taught Sunday school for many years before moving to Princeton in 1985. Surviving are two daughters, Nita Rogers Thompson of Bloomfield Hills, Mich., and Rita Rogers Oldham of Princeton; three grandchildren; and six great-grandchildren. She was preceded in death by her husband, Eugene Franklin Rogers; a son, Eugene Franklin Rogers Jr.; a brother, William Duke Hard; and two sisters, Sallie Irene Hard Dillon and Mary Augusta Hard Cranor. Her parents were William Roland and Nellie Coleman Smith Hard. Funeral services are at 10:30 a.m., Thursday, Dec. 3 at Morgan's Funeral Home with Dr. Jerrell White officiating, assisted by Dr. Gary Frizzell. Burial will be at Fredonia Cemetery. Memorial contributions may be made to Fredonia Valley Cemetery, c/o Hannah Brasher, Fredonia, KY 42411. When Homes for Our Troops project manager Rick Goyette told members of American Legion Post 68 and volunteer contractors and laborers “we’ll have this house under roof and weatherized by nightfall Saturday,” some thought he was being a little optimistic. After all, he made that statement on Wednesday night. But with this being the 40th home the organization has coordinated for wounded veterans, Goyette and his team have had some practice. With what they call a “Build Brigade,” good weather and a whole lot of hard work by skilled carpenters, that’s exactly what happened. 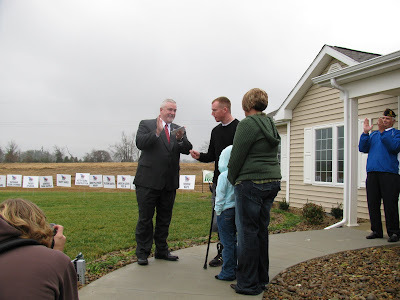 Goyette took a few minutes away from swinging his hammer on the home HFOT is building for local wounded veteran Chase Matthews last Thursday to bring dignitaries and the media up to date. Invited guests Bill Simmons and Debby Epperson of the US Department for Veterans Affairs regional office in Louisville may have been the most popular attendees – they brought a $60,000 check to help with expenses for this wheelchair-accessible home. “What could be more fundamental about a homecoming,” Goyette said, “than having a home you can come home to?” In Matthews’ case, the mobile home shares with his growing family is far from able to accommodate his needs. His wife Jennifer said that because of the narrow doorways and halls, Matthews is confined to the kitchen and living room while in his wheelchair. Extensive use of his prosthetic legs causes him pain and tires him quickly, she added. Along about October, that will include visiting the nursery the Matthewses will prepare to welcome their newest addition, or stopping in to say goodnight to stepdaughter Sarah in her room. “They think the house will be ready in time for us to bring the baby here when we come home from the hospital,” Jennifer said, “and that is just amazing to me. It’s amazing that people would do this for Chase, for our family, and I’ve seen houses being built before but nothing like this fast.” She noted that at 8 a.m. on Thursday the foundation and subfloors were finished, “and it was a big flat floor, like an empty stage,” and by the time the ceremony got underway shortly after 2 p.m. that day, crews had walls up and were setting trusses as fast as they could go. Two key people were noticeably absent from the podium. Rick Gill, Post 68 Vice Commander, has worked tirelessly organizing fundraisers and working as a liaison with the HFOT organization. His granddaughter sustained multiple injuries in an auto accident in Texas on Wednesday. He and his wife, post adjutant Pat Gill, immediately flew to her side and left matters in the capable hands of Commander Bill Howard. Howard emceed the ceremony, profusely thanking those who have contributed to the project with materials, labor, donations, and, in the case of Neda and Lonnie Bauer, donuts to feed the masses of men who volunteered their time and talents. Howard reminded those present that Post 68 has undertaken the challenge of raising a minimum of $10,000 with which to furnish the new home. The next fundraiser will be held on Saturday. Making use of the Legion’s charitable gaming license, a Mega-Bingo event will be held beginning at 1 p.m. in the outlet mall. The former Polo building is set to be the site of a bingo event with enough seating for 300 people, and Howard said all the proceeds (after generous payouts) will go the the furniture fund. In addition, the post is planning a 4-hour live radio auction in partnership with Princeton’s WAVE-J radio 104.9 for October. Any individual or business with items to donate should contact any member of American Legion Post 68. Present but not taking the microphone was one woman without whom this home might only be a wish. Marty Kares, who is employed by The Crittenden Press but is functioning in her capacity as a board member of the Three Rivers Homebuilders Association, has not only been a staunch supporter of this project, but has functioned as “coordinator-in-chief” on the local front. Kares comes from a long line of servicemen, and has said on numerous occasions “this is a cause that’s close to my heart.” She declined to take the stage, preferring instead to work behind the scenes. Behind the scenes or in front of a microphone, there is still much to do for this home to become a reality. For more information on Homes For Our Troops and the Matthews home in particular, visit www.homesforourtroops.org. (Editor's Note: Michelle Henderson began writing "Dycusburg News" beginning with the Sept. 17, 2009 issue of The Crittenden Press. It will be reprinted with permission on this site. Be sure to share your news by e-mailing dycusburg@yahoo.com). Congratulations to Bobby and Linda Mayes on the birth of their daughter, Evelynn Grace (Eve). She was born Sept., 9, 2009. She weighed seven pounds, 13 ounces and was 18.5 inches long. She is the granddaughter of Curtis and Jeannie Griffin. Congratulations to Jake and Jodie Selph on the birth of their daughter, Annie Marie. She was born July 1. Recent birthdays include: Keith Ethridge Aug. 14, Mckenzie Noffsinger Aug. 21, Rick Bowman and Mason Stinnett Aug. 26, Chase Matthews and Johnnie Lindsey Sept. 1. Recent anniversaries include Curtis and Jeannie Griffin July 4, Bobby and Linda Mayes Sept. 2. Rick Fondaw is home and feeling better after a short stay in the hospital. The Dycusburg Community Group had an impromptu roadside trash pick up on Tuesday, Sept. 8. Members gathered several bags of trash alongside Dycus Road, Hilltop Drive, parts of Owens Road and parts of Ky. 295. If interested in volunteering your time, please call or email Dycusburg@yahoo.com or 270-988-2758. The group plans to pick up trash on other streets in the coming weeks. The group would like to thank those who have made donations recently. There are a lot of projects in the planning stage. A meeting will be held soon in which details will be given. Watch this column for date, time and location. All interested are welcome to attend. Carol and Nathan Carroll and their children, Christian, Shawn and Kaleb of Louisville, along with Cierra Simpson and Kylie McGowen of Paducah visited with Curtis and Jeannie Griffin and Bobby and Linda Mayes the last week of August. Homecoming at the Dycusburg Baptist Church will be held Sept. 20. Send your questions, news, birthdays, births, anniversaries, riddle answers and your own riddles and thoughts of the week to dycusburg@yahoo.com. DYCUSBURG, KY - Mrs. Virginia Jewell (Ginalee), 75, of Dycusburg, passed away at 10:55 p.m., Tuesday, September 15, in Lourdes Hospital in Paducah. Mrs. Jewell was retired from the former Shawnee Plastics Company in Kuttawa and was a homemaker. She was a member of Dycusburg United Methodist Church in Dycusburg and a member of Princeton Eastern Star Chapter #315. Survived by two sons and daughters-in-law, Billy and Jewell Jewell of Caldwell County and Ed and Donna Jewell of Crittenden County; 5 grandchildren, 3 great-grandchildren, 2 step great-grandchildren; one brother, Gordon Travis of Paris, TN; two sisters, Lucille Bingham of Hobert, IN and Shirley McAllister of Princeton, Ky.
She was preceded in death by her husband of 49 years, Clarence "Junior" Jewell; two sons, Ricky Darel Jewell and Donald Wayne Jewell; one sister, Barbara Epperson; one brother, Virgil Travis and her parents, Elvin Travis and Gertie Henry Travis. Services will be 2:00 P.M. Friday, September 18, 2009 at Lakeland Funeral Home Chapel in Eddyville with Rev. Jessie Johnson and Rev. Mitch Coomer officiating. Burial will be in Dycusburg Cemetery in Dycusburg, KY.
Visitation will be 5:00-8:00 P.M. Thursday, September 17, at Lakeland Funeral Home in Eddyville. Memorials may be made to: Dycusburg United Methodist Church, P.O. Box 34, Dycusburg, KY 42037. PRINCETON, KY – A Revolutionary War veteran will finally be recognized for his service more than 220 years after the war ended. A dedication ceremony will be held Saturday, Oct. 10, at noon at Cedar Hill Cemetery in Princeton to recognize Longshore Lamb as a Revolutionary War patriot, as well as his wife, Sarah (Lee). Descendants will unveil a memorial marker at the cemetery for the couple at the cemetery. No records exist of the actual burial site for the early Caldwell County settlers from South Carolina. Longshore’s service has been documented and recognized through both the Sons of the American Revolution (SAR) and the Daughters of the American Revolution (DAR). Descendants proving their ancestral lineage to Longshore are eligible for membership. Lamb descendants will travel from all over the country for the dedication ceremony. A reception will follow immediately at the Princeton Tourist Welcome Center at 201 E. Main St. Everyone, including the general public, is invited to attend. Four students from the Dycusburg area graduated from Lyon County High School on Saturday, May 23: Shelby Peek, James Jasis, Allison LeFan and Brandon O'Bryan. All graduated with honors and received several scholarships at Class Night on May 21. Don’t forget to hang up your hummingbird feeders. The birds are returning from the Southern states. An inexpensive mixture that attracts them and is easy to make consists of sugar, water and red food coloring. Alternatively, you can buy the concentrate or ready-to-use mix at retail locations. Barbara Ethridge returned home from a visit with her sister, Carol Strilko of New Lenox, IL. Carol and her husband, George drove her home and will be visiting for a while. All donations to the Dycusburg Community Group are tax deductible, including any donations for the gazebo or the fireworks display on the Fourth of July at Dycusburg’s "Thunder Over the River" Celebration. The answer to last week's riddle was "a coffin." Once again, Linda Waters e-mailed with the right answer. This week’s question: "How far can a dog run into the woods?" E-mail dycusburg@yahoo.com with your guesses. Natalie Tabor and her daughter, Shelby Peek, spent Spring Break in Puerto Rico, reporting a fabulous trip. They stayed in San Juan and spent most days on the beach doing absolutely nothing. The weather was mostly sunny and about 90 degrees every day. They visited Old San Juan where they toured the historic district (including the capitol and Castillo de San Felipe del Morro) and enjoyed shopping. They went to dinner with friends from Paducah also vacationing in Puerto Rico and ate at a reportedly wonderful restaurant, Marisqueria Atlantica. The BODIES exhibition was on display and Shelby, a future doctor, had to go see it. Natalie said, "We joked that we had to go all the way to Puerto Rico just for this exhibit since we missed it when it was in St. Louis!" The highlight of the trip for Shelby was touring the El Yunque Rainforest. Natalie said, "while she had moaned and complained about having to get up early to go with 'a bunch of old people' to the Rainforest, her whole attitude changed when she learned Johnny Depp was filming a movie there. At that point, her mission became to find him! As we were winding up through El Yunque (which reminded me of The Smokies, but with palm trees), we rounded a curve and there he was! He was filming a scene with Aaron Eckhart. After blowing kisses at Johnny for an hour and taking his picture, she spent the next ten hours texting, Facebook-ing and calling all of her friends to gloat!" If you live in, work in, or know someone in southern Crittenden County and would like to have something such as a birthday or upcoming event mentioned in this column, please e-mail dycusburg@yahoo.com. Quote of the Week: "Opportunity is missed by most because it is dressed in overalls and looks like work," attributed to Thomas Alva Edison. We send our get well wishes to Jim and Debbie Richardson and to Curtis Griffin who fractured his ankle in a fall. We regret that the Dycusburg Community Group (DCG) will not be able to fund a fireworks show this Independence Day in Dycusburg. Unfortunately, our calls for donations have heeded next to nothing. The economy has impacted all of us, including our little group. That said, Dycusburg Grocery (Riverside Café) owner Star Mahns has stepped up to the plate and is organizing a "Thunder Over the River" fireworks show she hopes will be better than ever. To make a donation to the fireworks fund, now stop by the store or send your donations directly to: Star Mahns, 9728 State Route 70, Dycusburg, KY 42037. For more info, call 988-3004. In related news, the DCG is in the market for a gazebo for the Dycusburg Area Veteran's Park. If you have suggestions on where to purchase a gazebo or would like to offer some physical labor to help build it, call 988-2758 or e-mail dycusburg@yahoo.com. The descendants of Longshore Lamb, a Revolutionary War soldier who settled in Caldwell County near Claxton before 1810, are raising funds to erect a marker in his memory at the Lamb Cemetery. Longshore and his wife, Sarah Lee, had the following children: Mary (Polly) Lamb-Crow; William Lamb; Elizabeth Lamb-Reaves-Vaughn; Levi Lamb; Margaret (Peggy) Lamb-Farmer; Jensey Jane Lamb-Clayton; John Lamb, Sr.; Moses Lamb and Martin Lamb. Unfortunately, Longshore's exact burial location is unknown, but a memorial marker will be erected during a ceremony on Oct. 10, 2009. Last week's riddle asked: "The poor have it. The rich need it. It's greater than God. It's worse than the devil. If you eat it you will die." The answer? Nothing. Linda Waters e-mailed us with the correct response. This week's riddle: "The man who invented it doesn't want it. The man who bought it doesn't need it. The man who needs it doesn't know it. What is it?" E-mail dycusburg@yahoo.com and we'll publish the names of those who solve the riddle. DYCUSBURG, Ky. — Mr. Philip Buchanan, 68, of Dycusburg passed away at 3:54 p.m. Wednesday, May 27, 2009, at Lourdes hospital in Paducah. He was a graduate of the College of Lake County, Ill., School of Nursing and was a retired nurse for Winchester House of Libertyville, Ill. He was of the Baptist faith. Mr. Buchanan is survived by one son and daughter-in-law, Jason Wade and Ann Buchanan of Mayfield; one daughter, Becky Buchanan of San Antonio, Texas; two grandchildren, Chelsea Buchanan of Wisconsin and Carl Buchanan of Murray; one brother and sister-in-law, Harold and Teresa Buchanan of Crittenden County; four sisters and brothers-in-law, Dixie and Charlie Ray of Paducah, Darlene and Bill Tabor of Crittenden County, Nancy Buchanan of Boaz and Rosalee Wallace of Crayne; and nieces and nephews, Mike, Ricky, Joe, Angie, Kim, Maryanne, Starla, Darren, Sherry, Linda, Tina, Rodney, LeeAnn and Kristi. He was preceded in death by one brother, Wendell Buchanan; two sisters, Norma Nichols and Jeanette Sutton; and his parents, Roy Buchanan and Lula Martin Buchanan. Graveside services will be at 11 a.m. Saturday, May 30, 2009, at Dycusburg Cemetery in Crittenden County with the Rev. David Sphnix officiating. There will be no visitation. Lakeland Funeral Home in Eddyville is handling arrangements. The weather in the area has been beautiful for several days in a row, giving people a chance to mow their yards and to plant and maintain flowerbeds. We would like to remind everyone to be careful if you still have broken limbs on trees. You might not be able to see the broken limbs once the newly sprouted leaves cover them. Seven Springs is again searching for a pastor as Bro. Pleasant submitted his resignation. The Dycusburg Community Group (DCG) needs volunteers for its annual town clean up next month. The DCG is still in the planning stages and needs your help. If you are unable to volunteer time but would like to make a contribution, please mail to Dycusburg Community Group, P.O. Box 112, Dycusburg, KY 42037. As we stated in last week's issue, funding for the July 4 fireworks show is nearly non-existent. We fear a show may not happen in 2009 unless someone steps up to the plate and donates money for the fireworks. Get well wishes are extended to Jim and Debbie Richardson and to Parker Holsapple. The day started a little chilly but warmed up nicely for the Sunday fish fry at Dycusburg Methodist Church on May 17. Several people came and the food was delicious. Proceeds benefit the Dycusburg Cemetery. If you were unable to attend but would like to donate, please send a check to Dycusburg Cemetery Fund, P.O. Box 4, Dycusburg, KY 42037. To view some photos of the event, look for "Dycusburg.com" on Facebook.com (you will need to create an account to view the photos). Josh and Star Mahns recently hosted visitors: Josh's father, Jeff Mahns and grandfather, Walter. The "Almost Home" band played at the Riverside Café in Dycusburg on Friday. The store has been host to tons of great musical talent recently. Happy birthday to Dan Henderson (May 25), Aliyah Frutiger (May 27), Michael McKinney (May 20) and Mitchell McKinney (May 20). We're going to start including a "Riddle of the Week." Here's the first one: "The poor have it. The rich need it. It's greater than God. It's worse than the devil. If you eat it you will die." E-mail your answers to dycusburg@yahoo.com. We hope everyone had an enjoyable Mother's Day. Bless all of the mothers for their hard work, and bless all of those fathers who served double duty. The Cumberland River is covering the boat dock area, including over the Chase Matthews Pavilion. It's also approaching the bottom area on Hwy. 295 near Owen Road. Our sympathies go out to the family of Joyce Fitts, 73, of Eddyville who passed away on May 4 after a battle with cancer. She was a daughter of Raymond and Mary Dean (Hobson) Patton. She was buried at New Bethel Cemetery. Graveside services will be held Thursday, May 14 at 2 p.m. for Russella Sue Peek. A luncheon will follow at the Dycusburg Methodist Church. Final reminder: The annual fish fry to benefit the Dycusburg cemetery fund will be held Sunday, May 17 at 1 p.m. It is planned for the Methodist Church lot unless it rains. In that case, it will be held at the Baptist fellowship hall. Please bring a donation to help keep the cemetery clean and beautiful. Vacation Bible School will be held June 8-12 at Mexico Baptist Church. For more information, call 270-965-4059. As we stated in a previous edition, the fireworks at Dycusburg will not be even remotely as nice as they were last year without donations. Please consider sending a monetary donation to the Dycusburg Community Group, P.O. Box 112, Dycusburg, KY 42037. 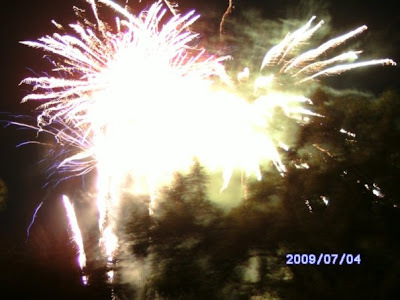 We know everyone enjoyed the show last year, and we're hopeful the community will pitch in to celebrate Independence Day again in 2009. The Dycusburg Grocery (aka Riverside Cafe) had its biggest crowd ever recently, with scores of people inside and out. Several bands and individuals sang and played instruments. It was a great night, enjoyed by all. It's nice to have such phenomenal talent tucked away in the tiny village of Dycusburg. Birthday wishes are extended to Daniel Patton (May 26) and Justin Peek (May 30). Dan Henderson recently enjoyed a trip to Havre, Mont. Although it was a short trip, he enjoyed seeing the landscape created by glaciers and snow covered mountaintops. Barbara Ethridge enjoyed her visit with her nephew, Matthew. She dog sat while he traveled to Europe, visiting London, Amsterdam and Oslo. He thoroughly enjoyed traveling around the beautiful cities across the pond. He landed in London where he spent the night and then took a cruise from Harwich, England to Amsterdam then to Oslo, where he flew back to London and on to the United States. Special thanks to the person who mowed and cleaned up around the Dycusburg Area Veteran's Memorial Marker recently. It is much appreciated by the community. Jeannie Griffin reports that Bobby and Linda Mayes are having a girl. Congratulations! As the warmth of the summer months begins to draw people outdoors, we want to take this opportunity to remind our readers to protect themselves from ticks. The nasty little buggers seem to be thicker this year than in years past. We close this week with a quote from Mark Twain: "The best way to cheer yourself up is to try to cheer somebody else up." Share your news by e-mailing dycusburg@yahoo.com. Photo: Weird Fish at Dycusburg! 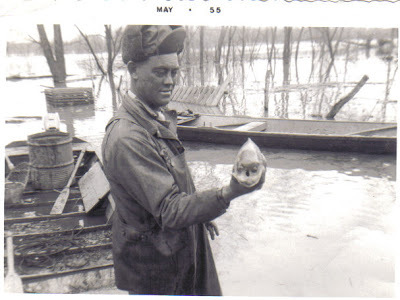 Lawrence Lynn Davenport with a fish he caught in Dycusburg when the Cumberland River was flooded (May 1955). Note that the fish has eyes ... in its mouth! Click image for larger version. 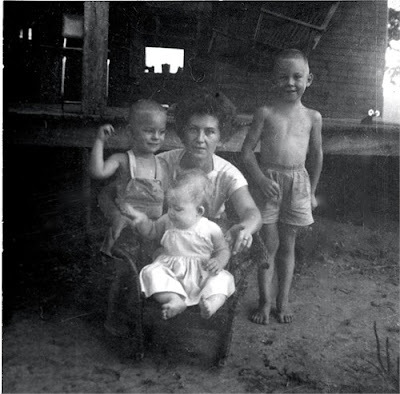 Teddie, Denny, Debbie and Robbie Davenport and the Willie Davenport homeplace near Dycusburg. Photo courtesy of Donna Walker. Click image for larger version. The fish fry for the Dycusburg Cemetery Fund will be May 17, at the Methodist Church. In case of rain, it will be held in the fellowship hall of the Baptist Church. Mark your calendars! Proceeds benefit the perpetual care of the cemetery. If you are unable to attend, please consider mailing a donation to Dycusburg Cemetery Fund, c/o Faye Stinnett, P.O. Box 4, Dycusburg, KY 42037. 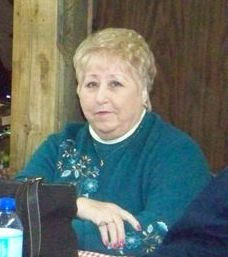 Sue Peek passed away on April 30. She is survived by her husband, Neil, and their two children, Donnie and Susan, and grandchildren. We send our condolences. We also extend our condolences to the family of Agnes Louise (Meeks) Givens. Ms. Givens passed away at her residence in Marion on April 26. Our sympathy goes out to Josh Mahns and family. They traveled to Indiana for Josh's mom, Debbie's, funeral. Josh's grandfather will be visiting Kentucky from Washington State for a few days of fishing in the lakes area. While on a business trip to Minneapolis MN, Gary and Gina Noffsinger, of Owensboro ran into Carl and Angie McLevein, of Lyon Co. and Troy and Stacie Belt, of Frances, while shopping at the Mall of America. The ties they all have to Southern Crittenden County show how small the world really is! The Mexico Baptist Church is having its Mexican Celebration on Saturday, May 9. It starts at 5 p.m. and will end with fireworks. Everyone is invited to attend. The Dycusburg Grocery Store ( Riverside Cafe ) had another "standing room only" crowd Friday night. The patrons enjoyed music performed by local talent. There are various musicians at the store every Friday night. All are welcome to attend. If you have news or event dates in our area, call Michelle Henderson at 988-2758 or e-mail to dycusburg@yahoo.com. Visit www.dycusburg.com for area information. Our sympathy is extended to the family of Eddie Wilford who died last week. We also extend our sympathies to Josh Mahns whose mother, Debbie, died on Monday. The annual fish fry to benefit the Dycusburg cemetery fund will be held Sunday, May 17 at 1 p.m. It is planned for the Methodist Church lot unless it rains. In that case, it will be held at the Baptist fellowship hall. Birthdays celebrated last week include Justin Noffinger (4/17), Regina Matthews (4/18), Justin Sutton (4/21), Jeannie Griffin (4/22), Amanda Oliver and Dylan Strilko (4/23). We are glad to hear Phillip Buchanan is home from the hospital and feeling better. Faye Stinnett and Barbara Ethridge visited Rhea Stinnett, Joy Ferguson, Millie Cole and Sue Peek at Springlake Nursing Home in Salem. When they left, Faye went on to Marion to pick up new eyeglasses while Barbara stopped at Livingston Hospital to give blood. They encourage anyone with extra time to visit or make a phone call to the sick, shut-ins and elderly. It is truly a blessing to both parties. The yard sale at Michelle Henderson's home was succesful at Dycusburg but contributions to the DCG and Homes for Our Troops, the organization building Chase Matthews and his family a new home, fell short of expectations. If you attended the Fourth of July celebration, "Red, White and Boom," last year at Dycusburg, we encourage you to send a donation to buy fireworks for this year's celebration. Without donations, a spectacular fireworks show will not be possible. Donations may be sent to: Dycusburg Community Group, P.O. Box 112, Dycusburg, KY 42037 (write "fireworks" in the memo area of your check). Watch this column for developments. Share your Dycusburg, Frances, Caldwell Springs, Seven Springs and other Southern Crittenden area news by e-mailing dycusburg@yahoo.com or calling Michelle at 988-2758. We received word that Sue Peek, wife of Neil Peek, passed away this morning at 6 a.m. She is survived by Neil and two children, Donnie and Susan. A home will be built for the family of Sgt. Chase Matthews who was injured in Iraq. To learn more, please watch the video. Happy birthday to Travis Williams (4/1), Brooke Pleasant (4/5), Kristie Thornton (4/6), Samantha Story (4/8), Amber Patton (4/8), Julie Conner (4/12), Bruce Guess (4/14), Terry Guess (4/16), Bobby Millikan (4/19), Orbin Penn (4/19), Kim Hamby (4/19), Jonathan Pleasant (4/25), Amanda Kennedy (4/25), John Clark (4/29). Congrats to Ricky and Paula Patton who celebrated their anniversary (4/2). Congratulations to Jeff Winding and Julie Walker who were married April 11 at Mermet Lake, Ill. They honeymooned at a Crittenden County cabin. The Dycusburg Grocery had record numbers on Friday for singing, with lots of new talent. It's once again a growing, hopping little place, reports owner Star Mahns. Our sympathies are extended to Josh Mahns on the death of his grandmother, Irene P. Dybalski-Mahns who died at age 85 on April 8 in Valparaiso, IN. She was born Dec. 28, 1923 in Gary, IN, to Clement and Mary Dybalski. She was married on June 28, 1946 in New Chicago to Walter H. Mahns, who survives of Valparaiso, IN. The Dycusburg Community Group will host a yard sale this weekend, weather permitting. A donation box will be on site at the sale for the Homes for Our Troops effort that will benefit Chase Matthews and his wife, Jennifer. 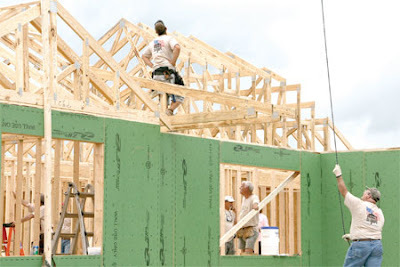 Homes for Our Troops is a Boston-area based organization that helps build specially adapted homes for severely injured veterans returning from Iraq and Afghanistan. Chase learned he was accepted into the program in February. To learn how to become more involved, visit dycusburg.com and look for the link for "Homes for Our Troops." Share your news tidbits! E-mail dycusburg@yahoo.com or call Michelle at 988-2758. We extend our sympathies to the family of Cindy Matthews-Smith, 44, who died Sunday night. She was buried at Dycusburg Cemetery. Additionally, our condolences go out to the family of Imogene Stout. The Dycusburg Community Group (DCG) yard sale was postponed due to weather last week. The DCG has set dates of April 17-18 for the next sale. During the yard sales, donation boxes will be on site to help fund future DCG events. Funds are low for the group and without contributions, festivities for this year will not match nor compare to the ones in 2008. Jenny Patton, Aliyah Frutiger and Emma Sosh enjoyed a visit with Jenny's uncle and aunt, Alan and Kay Phillips, in Lexington. The DCG is also looking for volunteers for a Spring 2009 cleanup. For info, call Michelle Henderson at 988-2758. Gina, Gary, Justin and McKenzie Noffsinger went to Tampa on vacation recently. The Owensboro Airport now offers a flight on Wednesdays and Saturdays nonstop to Tampa and back. A dedication ceremony for a marker memorializing Longshore Lamb and his wife, Sarah, will be held Oct. 10 in Caldwell County. All descendants of the Lamb family are invited to attend. Longshore served in the American Revolution as a militia man in South Carolina. If you have any news to share, please call Michelle at 988-2758 or e-mail us at dycusburg@yahoo.com. Cindy Matthews-Smith, 44, of Dycusburg, died Sunday, April 5 at 9:46 p.m. in Madisonville, KY. She was a daughter of Laymon and Maxine Matthews. Visitation will be Tuesday night at Dunn's Funeral Home in Eddyville. The Dycusburg Grocery is back to having regular fish fries on Fridays. The store is newly restocked with added menu items. Happy birthday to Brandee Bowman (April 4), Jody Beth Selph (April 8), and Amanda Oliver (April 23). Michelle Henderson, Barbara Ethridge and Jeannie Griffin enjoyed a shopping trip to Opry Mills in Nashville on Mar. 24. They had lunch at Johnny Rockets. A community yard sale will be held in Dycusburg on Friday and Saturday, weather permitting. For more information, call Michelle Henderson at 988-2758. Partial proceeds will benefit the Dycusburg Community Group. As we said before in this column, we certainly don't believe the ice storm was a result of God's vengeance upon Crittenden County. That's not what the Bible teaches at all, and it's foolish to think so. Instead, rejoice in knowing that God takes the form of loving neighbors, friends and community ... a light that has shined brightly in the past few months. Share your news, anniversaries, birthdays and other announcements by e-mailing dycusburg@yahoo.com or calling Michelle at 988-2758. 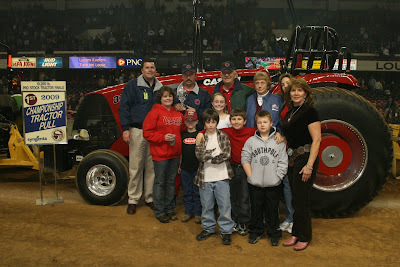 We extend our sincerest sympathies to the family of Luther Keith Shewcraft, 71, who died March 18. Keith was the elder son, and fifth child, of Luther Shewcraft and Oda Lee (Patton) Shewcraft. He was a loyal family man, a lover of music with a fine tenor voice, a great story teller, a great fondness for his horses and trail rides. He will be missed by many. We also send our sympathies to the family of Helen Baldwin, 103, who died March 16 at Hilltop Nursing Home in Kuttawa. Seven Springs had 74 in attendance for Sunday school, with several more arriving for worship services. 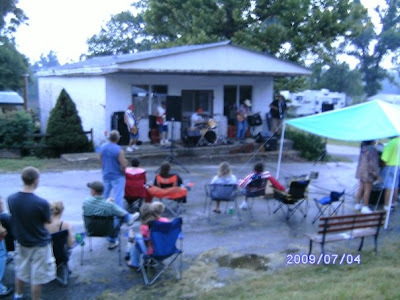 The Dycusburg Grocery had a standing room only crowd for music last weekend. If you get a chance, check out the little town’s gathering place. You’d be pleasantly surprised with the musical talent. Jason Smith is flying into Nashville for a short visit with his mom and grandmother at the airport. He’ll fly back to Houston with his daughter, Lavinia. Jeannie Griffin hosted a BBQ dinner at her home on Sunday night. We’re happy to report she is enjoying being back at work after a bout of illness. The Dycusburg Community Group is planning a community yard sale soon. For more information, call Michelle at 988-2758. Congratulations to Jeff and Jessica (Cox) LeFan on the birth of their son, Wyatt Jeffrey LeFan. He weighed 6lb., 5oz. and was 19 inches long. He was born at 3:54 p.m., March 16 in Wisconsin. Terry and Debbie Joiner celebrated their anniversary on March 18. Birthday wishes are sent to Gail Bannister (Mar. 19), Derek Burris who turns 18 (Mar. 23) and Jason Smith (Mar. 30). Nancy Kemper-Travis died on Mar. 11. Seven Springs had 76 in attendance for Sunday School. The church is planning an upcoming Easter play. We received an e-mail query from Shannon Buchanan who is "trying to find more information concerning my genealogy on my grandfather's side: Wendell Buchanan and my grandmother's side: Greta Jean Armstrong." She is also looking for any family pictures. Her family moved to Missouri due to employment with Chrysler and she is unable to get any of these items. If you have any information, please e-mail her at shannonilla@gmail.com or write her at 16 Joachim Dr., Eureka, MO 63025. Jenny Patton and Aliyah Frutiger, Travis and Emma Sosh, and Star and Jacob Mahns enjoyed an outing to the Rainforest Café in Nashville on Sunday. The Dycusburg Grocery had a sing-a-long last weekend. The grocery has live music every weekend. If you have a chance, swing down to Dycusburg and check it out. I am selling the Dycusburg book until April 1 for $45 ... a $25 discount. E-mail me at matthewtpatton@yahoo.com if you'd like to add your name to the list (I only have three left) and I'll set one aside for you. More than 500 copies of Dycusburg, Kentucky: A Glance at Her Past have been sold since it was published in 1999. The book, 443 pages, is hardbound with gold-embossed. If you're interested in ordering a copy at $45, e-mail matthewtpatton@yahoo.com. MARION, Ky. — L. Keith Shewcraft, 71, of Marion died Wednesday at Crittenden County Hospital. He was born January 1, 1938 and died March 18, 2009. He was a member of Fredonia First Baptist Church and a member of the National Trail Ride Association. Surviving are his wife, Kay Shewcraft; one son, Shelby Keith Shewcraft of Marion; two daughters, Maria Lee Belt and Caryn Renee Steele, both of Marion; one brother, Carlton Shewcraft of Marion, Ill.; five sisters, Betty Hodges of Marion and Edna Macon, Dorothy Young, Nell Martin and Carolyn DeSpain, all of Owensboro; seven grandchildren; and four great-grandchildren. His parents were Luther and Oda Lee Patton Shewcraft. Services will be at 2 p.m. Sunday at Gilbert Funeral Home in Marion. Burial will be at Mexico Cemetery. Friends may call from 6 until 9 p.m. Saturday at the funeral home. We start this issue with a safety alert! We've heard reports that something in the water is causing pregnancies in the area. We'll provide more on the baby boom in the coming weeks! A cleanup was held at the Dycusburg Cemetery on Saturday, March 7. Approximately 20 volunteers were on hand to pick up limbs and trees felled during the disastrous ice storm slamming Western Kentucky in late January. Faye Stinnett reported the day was a success. Thanks to those who continue to show concern for this cemetery's upkeep. Watch this column for an announcement concerning future cleanup efforts. Be sure to become a fan of Dycusburg at www.facebook.com to create an account if you haven't already done so. A big crowd was at the Dycusburg Grocery on Friday and Saturday nights. It has been a hopping little joint lately with live music on "Open Jam" Friday nights. Bingo has started back up on Saturdays at 7 p.m. Owner Star Mahns also says the store is now accepts Visa, Mastercard and Discover. Barbara Ethridge and Michelle Henderson flew to Harlingen, Texas and stayed at McAllen, Texas for a few days. While there, they visited Progresso, Mexico. After their stay in McAllen, they drove to Houston where they visited Jason, Nilcole, Lavinia and Jason Smith, II (or "Little Jason"). After their Houston stay, Barbara and Michelle drove back to Kentucky with Lavinia who will be visiting for a few weeks. If anyone needs notary services, please call Michelle Henderson at 988-2758. Share your birthdays, anniversaries and other news by e-mailing dycusburg@yahoo.com or calling Michelle at the number above. We were saddened to hear the news of the death of radio legend Paul Harvey last week at age 90. Several years ago, Harvey mentioned our little town of Dycusburg in one of his reports (let's just say it wasn't anything worth bragging about). Growing up, we couldn't wait to hear "the rest of the story." Harvey's calm, dignified style of weaving a story through unique, folksy delivery was truly an art to be admired. To you, Paul, we say, "good day." In other news, we were just absolutely thrilled and ecstatic to see our new president in his first address to Congress on Feb. 24. It's so nice to have an intelligent, well-spoken, respectable man in the highest office in our land. We remain hopeful for the economic stimulus to be effective toward getting our country headed in the right direction. Lots of birthdays to include this week! Birthday wishes are extended to Anna Patton (Feb. 22); Donna Davenport-Walker (Feb. 13); Courtney Smith (Mar. 1); Brad McDowell (Mar. 3); Verna Mae Kinnis (Mar. 5); Demetrius Kinnis (Mar. 6); Juana Mae Stone (Mar. 6); Wilma Allen (Mar. 10); Robert Millikan (Mar. 12); Samson Pleasant (Mar. 13); Tyler Guess (Mar. 15); Dennis Guess (Mar. 15); Melissa Asbridge (Mar. 18); Joann Peek (Mar. 20); Connie Travis (Mar. 24). Anniversaries celebrated this month are: Ronnie and Phyllis Blake (Mar. 7), Lonnie and Helen Travis (March 15) and Bob and Shelia Wilkinson (Mar. 23). More than 100 were in attendance for worship services at Seven Springs on Sunday. The church seems to be growing. The annual cemetery fundraiser fish fry at Dycusburg will likely be held in May again this year. Donations for the Dycusburg Cemetery can be mailed to Faye Stinnett, P.O. Box 4, Dycusburg, KY 42037. The perpetual fund ensures the maintenance of the graveyard. Share your news. Call Michelle at 988-2758 or e-mail dycusburg@yahoo.com. I am posting here to express my strong support for the Matthew Shepard Local Law Enforcement Hate Crimes Protection Act. This bill, which passed both houses of Congress in 2007 but did not become law, would protect lesbian, gay, bisexual and transgender (LGBT) people from bias-motivated hate violence. While all violent crimes are heinous, hate crimes are uniquely destructive, casting a pall of terror over an entire community. They don't just target a single victim. They are designed to "send a message" that an individual and "their kind" will not be tolerated, often leaving large numbers of people feeling isolated, vulnerable and unprotected. Attacks against LGBT people are one of the more common forms of hate violence but, illogically, one of the least protected. Hate crimes as a whole declined 1 percent last year, according to the FBI, but LGBT hate crimes increased 6 percent. It's long past time that we expand federal hate crimes law to cover sexual orientation and gender identity. And we must give local law enforcement officials the resources needed to investigate and prosecute these crimes. Please protect civil rights by urging your representatives in Washington to give this bill full support and attention, and by urging your colleagues to support it as well. Snagging first place in the 10,200 lb. 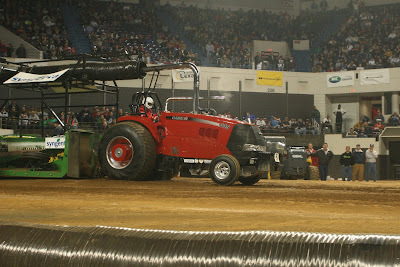 pro stock tractor division at the National Farm Machinery Show in Louisville, KY, was Philip Parish driving "El Niño," pulling 244.49'.